Caroline Warfield Guest Blog & Giveaway! My stories begin with four things: a hero, a heroine, an ending, and a setting. Once I have those I can begin to construct conflict, motivation and plot. Of the four sometimes setting comes first. My new release, Dangerous Secrets began with the question, “Can I write an regency romance set in Rome?” Why not! Setting can be an important force in any novel. It is critical however that the subtle details of place be integrated in every scene. This is as true for a traditional regency set in London ballrooms and drawing rooms as it is for more exotic settings. It isn’t enough to just plunk the story down somewhere. In the case of Rome it helped that I have been there a few times. When I put the hero’s room in a run down neighborhood, I chose Trastevere, the place “beyond the Tiber,” the wrong side of the tracks, so to speak with its narrow lanes and open piazzas. When I put Nora and Jamie at a sidewalk café near the Tiber Island bridges, it helped that I had walked over them. The Count’s palazzo and Nora’s brother’s villa took more imagination, but familiarity with the feel of the city helped. When personal experience fails, photography helps. Like many authors I’ve begun to storyboard my novels on Pinterest. Visual cues feed my imagination and help engage the right side of my brain and my creativity. History and research is critical, of course. Once I settled on Rome I discovered quite a bit about pre-unification Italy, the Papal States, and the House of Savoy, all of which influenced the final work. Where there English people in Rome in 1820? Keats, most notably was dying in a house by the Spanish Steps. Artists of all kinds flocked to Rome. Did Britain have an ambassador to the Papal States? Not formally. They worked through the Hanoverian delegation. These details matter in how the characters function. Another element in creating setting is maps. I’ve studied more maps of London than I care to count. It helps to nail down neighborhoods and even street names. In 1815 Chelsea, Bloomsbury, and Mayfair existed but would have housed very different folk. Rome is no different. When an author can use the sights, smells, and sounds of a place to contribute to atmosphere and emotion, he or she has done well. I try for this, but I’m not always satisfied with the results. When I am not satisfied, I try again on the next one. When a little brown wren of an Englishwoman bursts into Jamie Heyworth’s private hell and asks for help he mistakes her for the black crow of death. Why not? He fled to Rome and sits in despair with nothing left to sell and no reason to get up in the morning. Behind him lie disgrace, shame, and secrets he is desperate to keep even from powerful friends in London. Enter the Dangerous Secrets Blog Tour 2015 contest to win the right to name characters in an as yet not written novella and an Amazon gift card. Caroline Warfield has at various times been an army brat, a librarian, a poet, a raiser of children, a nun, a bird watcher, a network services manager, a conference speaker, a tech writer, a genealogist, and, of course, a romantic. She is always a traveler, a would-be adventurer, and a writer of historical romance, enamored of owls, books, history, and beautiful gardens (but not the act of gardening). This book began with the thought, what could I do with English regency-era characters if I put them in Rome? Today is the day to answer the #9 question for BLEDDYN HALL on The Romance Review’s 4th Anniversary Party! Click the picture tot he left or click HERE to participate! Over 350 prizes and a Grand Prize of $100 gift card! In Bleddyn Hall by Amanda L.V. Shalaby, what happens when Lord Tresham Bleddyn’s father passed away? The Answer is C: All of the Above! 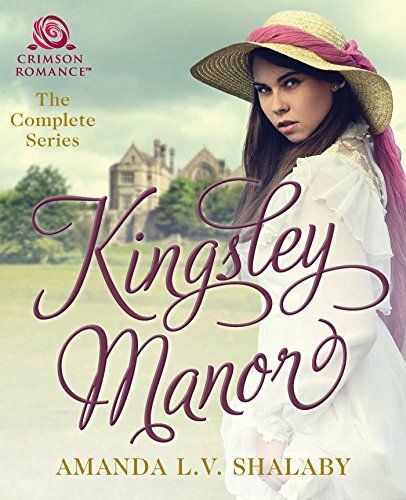 How Did I Come Up with my Gothic Romance Bleddyn Hall? Visit Me Today on Becky Lower’s Blog!